Now that I've finally perfected my workflow for getting the most out of the Fuji X-Trans raw files, I was eager to try it out on a proper project. I was fortunate enough to be able to do some travel photography before Christmas, and my first port of call was the Belgian capital of Brussels. The tightly packed city streets presented an deal opportunity to use a small mirror less camera, and so I headed out one chilly winter morning. Normally, I would take the 35mm, but as the streets in Brussels are pretty tightly packed, I decided to use the 18-55mm instead. Not only would this give me a bit more room on the wide end, but it would also allow me to zoom in to pick out detail where necessary. The mall itself was adorned in festive decorations and there were some great shops with interesting window displays. I couldn't help but be drawn to this one filled with great little statues including a very laden down photographer. After I stopped for coffee and a waffle, I returned to my journey to the Grande Place. Finally I arrived at the street that ran parallel to it. I headed there first as I remembered this great piece of street art that I had to get a shot of. I waited for the right opportunity and got a great shot of a guy taking a photo up against the beautiful text covered wall. Finally I made it to the square of the Grand Place itself. In the centre was a large Christmas Tree and Crib celebrating the Christmas Season. There were a few tourists about, and some local school kids, but the place was fairly empty. This wasn't surprising mind you as it was pretty cold at this stage. As I wandered around taking photos I was asked several times to take photos for tourists. After a while I almost began to feel like official photographer. Still, I got to meet some lovely people from a several different nationalities. It's interesting too when people try to explain to you how t use their cameras, unaware of my photographic experience. My favourite was one young woman pointing out to me that I had to look through the viewfinder of her Canon rebel rather than use the screen. Anyway, I finally got back to my own photo taking and tried to capture some images of the 17th century architecture. Once I had finished exploring the square I headed down one of the side streets towards the Christmas Market. Here there were lots of stalls selling candy and mulled wine, as well as food from various nationalities. To be honest it didn't seem that christmassy though. It was kind of tacky and there wasn't much of a festive feeling, and it could have really been a market for any time of the year, as it was mostly food. I don't think that this is the main Christmas market though that people talk about, as apparently there is another one that is much better (or so I was told). Still, it was a good opportunity for some interesting photos. Eventually I left the area and headed up the large hill that led to one of the boulevards which would bring me back to my hotel. On the way I got a great view of the city from up high. I finally got back to my hotel after several hours of trekking around cobblestone streets, pretty wrecked. Incidentally, the hotel we were staying in is a remarkably trendy hotel called "Bloom" which is located beside the botanical gardens. If you're ever staying in Brussels, I can heartily recommend it. The rooms are hip and modern and the staff are great. The next and final leg (of my two leg) journey would take me to the beautiful winter cityscape of Paris, and I'll have more from that in a few days. 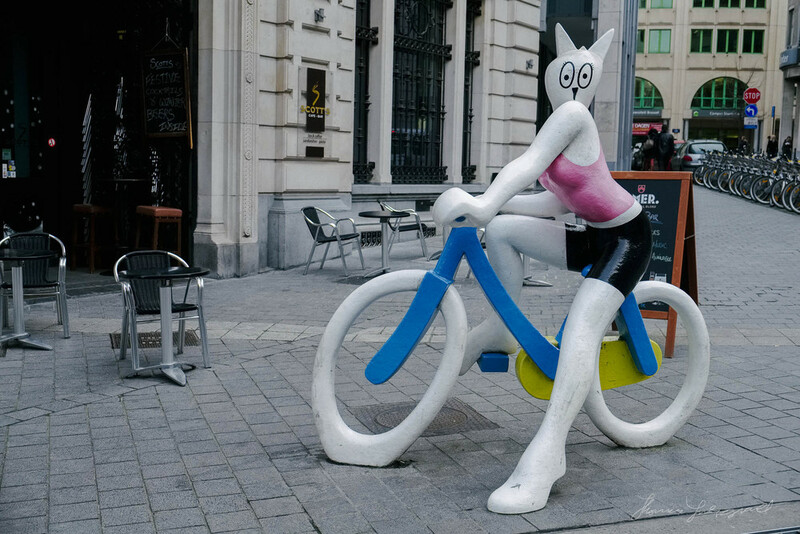 In the mean time you can see the complete set of images from my little wander around brussels here. If you are wondering how I processed these, I used the techniques I talked about in my video tutorial on the subject a while ago.